The Cisco ASA failover configuration requires two identical security appliances connected to each other through a dedicated failover link and, optionally, a stateful failover link. The health of the active interfaces and units is monitored to determine if specific failover conditions are met. If those conditions are met, failover occurs. In case of Active/Active configuration both Units carry traffic (unlike Active/Standby whereby only the active unit carries traffic). For creating active/active Failover, configuring both ASA devices in Multiple context mode is required. For ASA redundancy scenario the two devices must be the same models, must have the same number and type of interfaces and the same license is required. ASA 5505 and 5510 do not support active/active failover without license upgrade. For active/active configuration, Failover Contexts and Failover groups need to be created. The Failover group is then applied to Primary or Secondary physical ASA unit. After this, the particular Failover group is applied to a Context. For example, primary unit is active ASA of Failover group1, but Secondary unit is Standby ASA of Failover group1. If primary ASA is out of order, Secondary ASA will become Active of Failover group1. 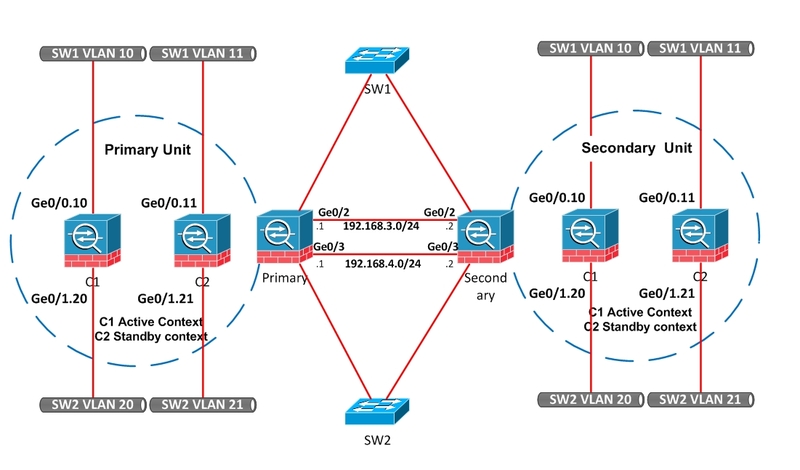 For explaining Active/Active Failover configuration in details, let’s do the following LAB. !Switch both ASA devices to multiple context mode. !When ASAs are reloaded, connect them to each other with Ge0/2 and Ge0/3 ports. First start with the Primary Unit configuration. Before starting configuration, all interfaces must be in the up state. !set this unit as primary. Determine Failover and State interfaces. These two interfaces can be the same physical interface if you don’t need to consume one extra port. In our example here we use two separate physical interfaces. !assign IP address on Failover Interface. MUST be in same Subnet as the standby on the other unit. !Create Failover groups, where Failover group1 will be the Primary, i.e. active on Primary Unit and Failover group2 will be the Standby on Primary Unit. Configure also HTTP Replication, after which occurs HTTP Connection state replication between active and Standby ASAs. Also determine Preempt Delay. Preempt Delay means in what time to regain role of Active after Fail Recovery. Now let’s start creating Contexts and assigning interfaces in each Context. !Snap each Context to Failover Groups. If we don’t indicate Contexts to Failover Groups, each context will be in Group1 by default. !Configure IP addresses on Context1. !Configure IP addresses on Context2. Now let’s start Secondary Unit configuration. !assign IP address on Failover Interface. MUST be in same Subnet as other unit. With the above piece of configuration commands everything is completed and now let’s start checking. As we observed from above, active/active Failover is working and everything is as expected. Can you please tell whether ASA 5540 supports active active status without license upgrade ? Yes, ASA5540 supports Active/Active standby without any license upgrade. While configuring Two Active / Active Cisco 5540 ASA can we configure Site to Site VPN there ? Only version 9.x supports VPN for multiple context mode. Active/Active requires multiple context mode so you must have ASA version 9.0 or 9.1 to support VPN. Released date is October 29, 2012 and Updated on February 25, 2012. Just a suggestion what you think it would safe to use 9.0 as it is almost new ? Or Do you think this is already a stable IOS ? This is not really true active/active for one context. What you are really doing is leveraging contexts to make two different inside networks leverage different active firewall. This is something that should be mentioned. I believe clustering is the only option? Just to note that the article was written circa 2013. Active/Active requires support for multiple contexts. This is one way how Cisco implements active/active on ASA and yes you are right about your comment. Now the more advanced option of “active/active” is by using clustering.